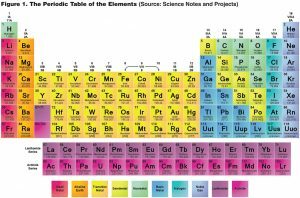 All of the chemicals listed in The Periodic Table of the Elements (see Figure 1) are made up of atoms, which are combinations of electrons (negative charge), protons (positive charge) and neutrons (neutral charge). The protons and neutrons are contained in the nucleus of the atom. The electrons surround the nucleus as more of a charged cloud. Electrons and protons are always equal so all elements are neutral. The total number of protons determines the atomic number (AN) and the combination of protons plus neutrons determines the molecular weight (MW or atomic weight AW) of the element. Since the elements are neutral, the compound they form by combining is also neutral. Example: sodium (Na) is Element #11. It has 11 protons and 11 electrons. It also has 12 neutrons so it has an atomic number of 11 and a MW of 23. When it reacts with chlorine (Cl) (Element #17 with a MW of 35.5) it forms a compound (sodium chloride, NaCl), which is also neutral and has a MW of 58.5, the total of the two components. Chlorine is found in nature with two primary isotopes (variants of a chemical element that differ in neutron number). One has 18 neutrons and the other has 19 and they are found about equally distributed. The average MW is, therefore, the sum of the protons (17) plus the average of the neutrons (18.5) for an average MW of 35.5. Reaction 1: Na + H2O → NaOH + H↑ hydrogen gas is liberated and sodium hydroxide is formed. Reaction 2: Cl2 + H2O → HCl + HOCl hydrochloric and hypochlorous acid are formed. Reaction 3: NaOH + HCl → NaCl + H2O the product of neutralization is salt plus water. When salt is dissolved in water, it dissociates into ions that are charged particles. The positive ions are called cations and the negative ions are called anions. The charge is due to the gain or loss of negative electrons. Reaction 4: NaCl + H2O ↑ Na+ + Cl– + H+ + OH– the plus and minus charges are equal. With dissociation, sodium loses one electron (loss of a negative charge) and becomes positive (sodium ion) (see Figure 2). Chlorine gains one electron and becomes negative (chloride ion). These are written to show the charge as Na+ and Cl–. We refer to this level of charge as the valence of the element or ion. Valence is determined by the number of electrons lost or gained when ionized and is typically limited to only the outer orbit of the atom. The valence values are typical of the element but not fixed. Nitrogen, for instance, has a valence of -3 when combined with hydrogen to form ammonia gas (NH3). However, when it combines with oxygen to form the nitrate ion (NO3–), it has a valence of +5. That’s because nitrogen (Element #7) is an atom with five electrons in its outer orbit. To satisfy its outer orbit, it can either give up five electrons (becoming positive +5) or pick up three electrons (becoming negative -3). At the lower AN ends of The Periodic Table of the Elements columns, the magic number for electrons is an inner orbit of two and outer orbit of eight (see Figure 2). When elements react with one another, they do so on the basis of their equivalent weights (EW). EW is a real weight number that equates how much of element A is required to react with X amount of element B. In our molecule example shown in Figure 2, it would take 23 grams (or milligrams or pounds or tons) of sodium metal to fully react with 35.5 grams (or pounds, etc.) of chlorine gas to form 58.5 grams, etc. of sodium chloride. The MW of an element divided by its valence equals its equivalent weight. This is very important when dealing with ion exchange reactions and multivalent ions (having a valence >1), such as calcium, magnesium, sulfates and arsenic. Example: How much sodium is put into a water stream from a softener treating 80 mg/L of calcium and 24 mg/L of magnesium? The MW of calcium is 40 and the valence is 2 (EW = 20). The MW of magnesium is 24 and the valence is also 2 (EW = 12). The MW of sodium is 23 and the valence is 1 (EW = 23). So we have EW for calcium of (40/2 =) 20 and magnesium is (24/2 =) 12. Sodium is (23/1 =) 23. In numbers of equivalents, we have 80/20 = 4 for calcium, 24/12 = 2 for magnesium. So we will exchange 4 + 2 equivalents of hardness for 6 equivalents of sodium. Thus: 6 x 23 = 138 mg. We took out 120 mg/L of hardness and replaced it with 138 mg/L of sodium. We did increase the TDS but we did not increase the number of equivalents (i.e., the number of ions or ppm as calcium carbonate: CaCO3). A single atom of any element is identifiable as that element. Gold is made up of the same electrons, protons and neutrons as helium, yet they are very different. Alchemists have been trying to change that for centuries. Each element has a unique combination of electrons, protons and neutrons that determines its properties and how it behaves in a chemical reaction. 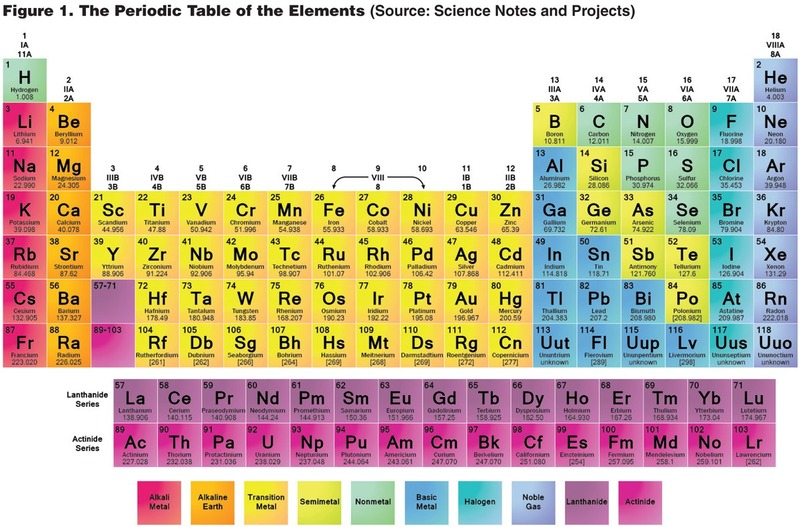 Elements with similar behavior form families and are represented as a single vertical column on The Periodic Table of the Elements. An example is the halide family (column 17): fluorine, chlorine, bromine and iodine, all unique but each with similarities to the others. Another example is the inert gases (column 18): helium, neon, argon, krypton, xenon and radon. These elements are very happy by themselves and do not react with others. Once a salt is dissolved in water, it is no longer associated with its counter ion (the partner it came in with). A mixture of calcium chloride, magnesium sulfate and sodium bicarbonate will dissolve, dissociate and become six different and independent ions. Different elements from different columns of The Periodic Table of the Elements will have different molecular weights and different valences due to electron transfers when they become dissolved in water (ionized). 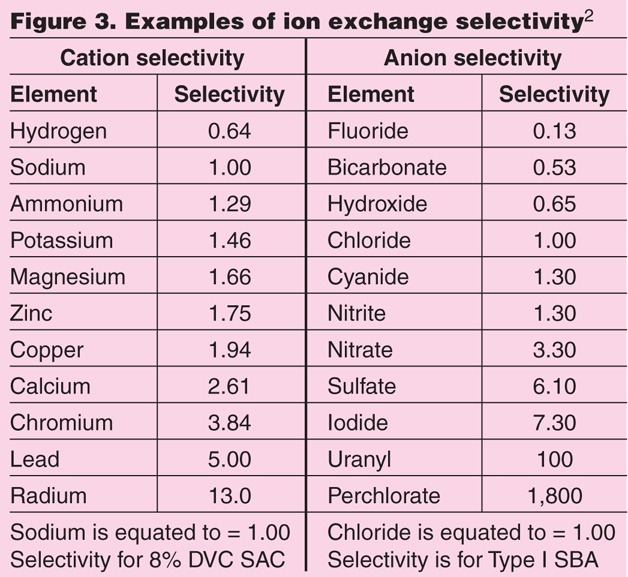 This difference in charge and weight gives them higher and lower selectivity (reactivity preference—the higher charge and higher MW will generally increase the ionic selectivity) when combining with other ions, which can determine their solubility or volatility. This is the basis for the equilibrium in an ion exchange reaction. This is also the reason why ion exchange works. Single atoms of elements are extremely small; so small, in fact, that their size is hard to comprehend in terms of measurements with which we are familiar. If we take a standard such as the meter (one-ten-millionths of the distance from the Equator to the North Pole) and divide it into 1,000 parts, we have the millimeter (mm). We use mm to measure granular filter media, such as activated carbon. Divide that by 1,000 and we now have the micron (µm). We use microns to measure even smaller particles that we can still see (ion exchange resins are typically 300 to 1,000 µm) and some that we cannot see without a microscope (bacteria are in the 1-100 mm size range). Human blood cells are around the 8-µm range. Dividing a single micron by 1,000 gives us the nanometer (nm). You could fit about 100,000 of them inside the period at the end of this sentence (side by side). That’s getting down there but in terms of molecules, it’s still pretty big. Divide the nm by 10 and we get a unit of measure called the angstrom (Å), which is one-ten-billionth of a meter. Now we are at a molecular size level. Hydrogen is only 0.25 Å in diameter; sodium and potassium are much larger at about 2 Å. Atoms are mostly space in that the nucleus of an atom is only about one-ten-thousandths (1/10,000) of its total diameter. The electron cloud has volume but is not considered to have much mass. Picture, if you will, a hot air balloon 10 meters (about 33 feet or 10,000 mm) in diameter (with a volume of >500 m3). Place a single grain of sand in the center of the spherical balloon and a tiny speck of dust on the outer surface. You have a proportioned model of the hydrogen atom with the grain of sand representing the size of the nucleus and the dust particle representing the electron cloud. This helps paint the picture that our universe and everything in it is pretty much void space. Amedeo Avagadro (1776-1856), was an Italian physicist active in the early 19th Century. In 1811, Avagadro made the observation that “equal volumes of different gases at the same temperature and pressure, have the same number of molecules.” This became known as Avagadro’s Law. Over the next century, several brilliant scientists using different methods to do the calculations answered the $64 question: How many molecules are present in a gram-mole of any element? A gram-mole of any substance is the quantity of that substance, measured in grams, that is equal in number to the MW of that substance (i.e., 12 grams of carbon, 1 gram of hydrogen, 197 grams of gold). The answer is 6.022 x 1023 (that’s 602,200,000,000,000,000,000,000) and is given the name Avagadro’s Number (NA) to honor the physicist. If you divide the quantity of the value for a gram-mole of any element by its valence, you derive a number that represents the gram-equivalent weight for that substance. Calcium has a MW of 40 and valence = 2. The EW for calcium is (40/2 =) 20 and the gram-equivalent is 20 grams. 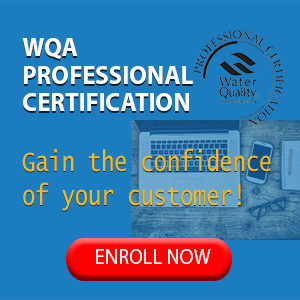 This is an important relationship because in ion exchange chemistry, capacity is given as milli-equivalents/milliliter (meq/mL). This is the same as a gram-equivalent/liter or eq/L. A capacity value of 1.0 meq/mL means that an ion exchange resin would have the capacity to hold 20 mgs of calcium per milliliter of resin or 1.0 equivalent of calcium per liter of resin (1.0 equivalents of calcium = 20 gms). An ion exchange resin is a polymer (plastic), usually used as a small bead (about 0.5mm [500 µ]) that contains a fixed, insoluble matrix as part of the bead structure and a movable or replaceable mobile ionic component that can be exchanged for other mobile ions in solution. The degree of the exchange is a variable that is driven by the previously mentioned selectivity. Calcium, for instance, forms a divalent ion (Ca+2) that has a stronger attraction to the exchange matrix than does monovalent sodium (Na+1). Therefore, if a solution containing Ca+2 is passed through a bed of resin in the Na+1 form, the matrix will pick up the more selective Ca+2 and release the less tightly held Na+1. This is how and why a softener works. Reaction 5: Ca(HCO3)2 + O-Na ↔ O-Ca + NaHCO3 the softening reaction. The ↔ indicates that the reaction is reversible. Reaction 6: O-Ca + NaCl ↔ O-Na + CaCl2 + NaCl the regeneration reaction showing excess salt used. Softening resins are quite small, measuring only about 600µ (0.6mm) in diameter. It is calculated that you can fit 6,891,038 of them into a one-liter beaker. Each tiny bead has 1.75 x 1017 reactive sites inside. Fully saturated, a cubic foot of cation softening resin can hold 56.64 equivalents of pure calcium hardness. That’s almost two and a half pounds (56.64 x 20 = 1,132.8 gms). Yes, you can use an ordinary softener regenerated with salt (NaCl) to remove ammonium from feed water because the selectivity for ammonium (NH4+) is higher than that of sodium (Na+) (1.29 versus 1.0). But what happens as the resin approaches exhaustion and/or you have hardness present (the selectivity for calcium [Ca] and magnesium [Mg] is much higher than that of ammonium [NH4]) (2.61 and 1.66 versus 1.29)? You will dump ammonium, perhaps at levels of 5-10 times that of the feed water. The same holds for nitrite and nitrate in a high-sulfate water. There’s no need to worry about radium being removed by a softener because the radium has a much higher selectivity than does hardness (13.0 versus 2.61 and 1.66). It’s the same for uranium over sulfate. Make sure you understand the sequences in which ions are picked up and released by ion exchange resins. The selectivity on SBA for chrome +6 (CrO4-2) is 100. It is far more selective than sulfate and will be picked up preferentially even after the resin has exhausted on sulfates. The selectivity for arsenic +5 (HAsO4-2) is 4.5. That is lower than that of sulfate (6.1). * Be careful! 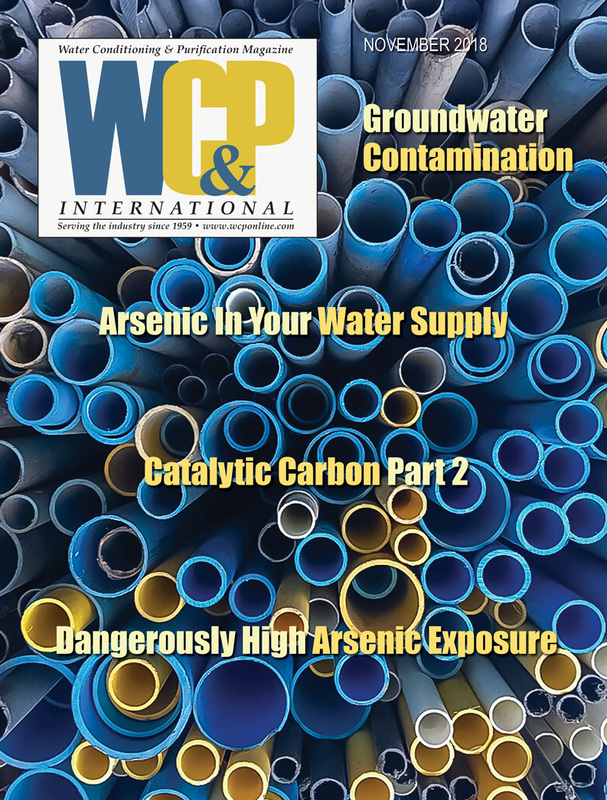 Reduce your capacity setting to make sure you don’t exhaust the resin to avoid dumping high levels of arsenic back into the treated stream. Ion exchange is an excellent media for the selective removal of contaminants. 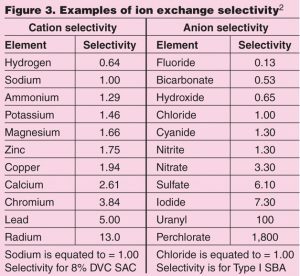 Ion exchange works on the principle of positive and negative charge attraction and selectivity. 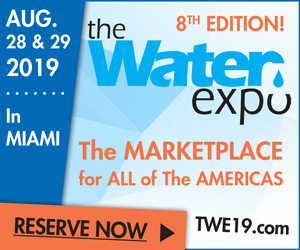 Selecting a proper ion exchange treatment, however, is a bit more inclusive than simply buying what sounds like the correct resin off the Internet. The best advice is to talk to those familiar with proper design. Do your homework and don’t be afraid to ask questions. 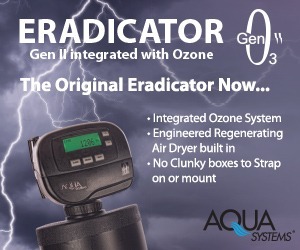 When you are dealing with carcinogens and toxic elements, you can’t afford to fail. (1) Definition of Femtometer and proton diameter. Wikipedia. (2) Michaud, C.F. “The Basics of Chemistry-Part 3,” WC&P International, June 1998.